For courses covering finite mathematics and/or calculus for students in business, economics, social sciences, or life sciences. Barnett/Ziegler/Byleen is designed to help students help themselves succeed in the course. This text offers more built-in guidance than any other on the market—with special emphasis on prerequisites skills—and a host of student-friendly features to help students catch up or learn on their own. The content is organized into three parts: (1) A Library of Elementary Functions (Chapters 1-2), (2) Finite Mathematics (Chapters 3-9), and (3) Calculus (Chapters 10-15). Personalized learning with MyMathLab®: the accompanying MyMathLab course provides online homework and learning tools that help students help themselves succeed. More than 6,900 exercises in the text help you craft the perfect assignments for your students, with plenty of support for prerequisite skills. Built-in guidance helps students help themselves learn course content. 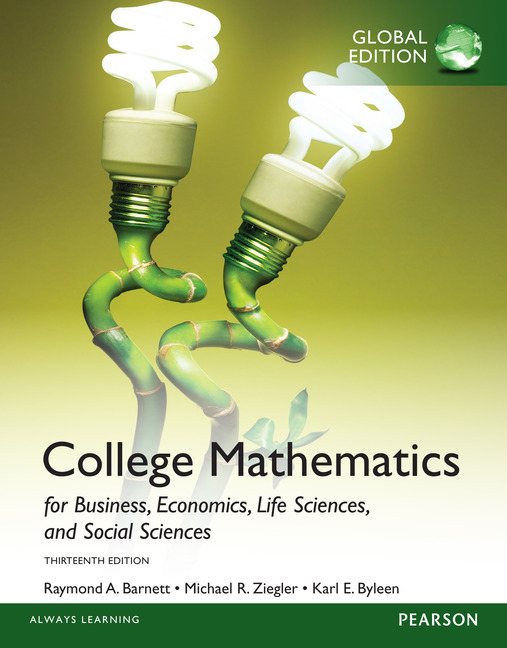 Flexible coverage allows instructors to use this text in a way that suits their syllabus and teaching style. Built-in guidance helps students help themselves learn the course content. 483 worked examples, including many with several parts. Examples are annotated and the problem-solving steps are clearly identified, which gives students extra assistance in understanding the solution. Dashed boxes show the detailed algebraic steps that are normally not included in textbooks, giving students extra help in working through the examples. A Matched Problem follows each example, providing students with an opportunity to reinforce and test understanding before moving on. Conceptual Insight boxes, appearing in nearly every section, either make explicit connections to previously learned concepts or provide a broader, more conceptual explanation of the topic, helping students place this new information in context. Explore & Discuss problems in every section encourage students to think about a relationship or process before a result is stated or to investigate additional consequences of a development in the text. These problems can help students of all levels gain better insight into the mathematical concepts and are effective in both small and large classroom settings. NEW! The author has provided Teaching Tips for less-experienced instructors on how to engage students in these discussions and the goals of the exploration. A Library of Elementary Functions (Chapters 1-2) provides optional material that can be covered in its entirety or referred to as needed. Finite Mathematics (Chapters 3–9) coverage features a separate chapter on the simplex method and thorough coverage of Markov chains. Calculus (Chapters 10-15) coverage features early treatment of exponential and logarithmic functions plus more in-depth coverage of calculus topics than other texts. Emphasis on the construction of mathematical models, especially in linear systems and linear programming, gives students critical tools for solving application problems. Technology coverage is optional, but discussions on using graphing calculators and spreadsheets are included where appropriate. Mini-Lectures are included for most sections of the text and provide additional classroom examples, a summary of suggested learning objectives, and teaching notes for the material. These mini-lectures are ideal for instructors who do not teach this course frequently, or just need some additional guidance or resources.